Who are the Traditional Thomists? "The Universal Kingship of Our Lord Jesus Christ"
Link to French article: Reginald Garrigou-Lagrange, O.P. "La Royauté universelle de Notre-Seigneur Jésus-Christ," La Vie Spirituelle, 73 (1925), 5-21. And Searcher of the mind and heart. Who hail thee King of kings most High. The strayed bring home within the fold. On fire with love, pierced by the dart. Abides for man the life divine. Art, science, law, thy truth express. Rule o'er the people's homes in love. And Holy Ghost for evermore. Amen. Unfurl his standard to the sky! The King of kings with homage greet. He would on love alone rely. There upon earth God's will is done. Firm stands life's wise and ordered plan. Of every pure and modest grace. From thy glad praises never cease. From Garrigou-Lagrange, OP - Reality (available from ITOPL). We deal here with those commentators only who belong to the Thomistic school properly so called. We do not include eclectic commentators, who indeed borrow largely from Thomas, but seek to unite him with Duns Scotus, refuting at times one by the other, at the risk of nearly always oscillating between the two, without ever taking a definite stand. In the history of commentators we may distinguish three periods. During the first period we find defensiones against the various adversaries of Thomistic doctrine. In the second period commentaries appear properly so called. They comment the Summa theologiae. They comment, article by article, in the methods we may call classical, followed generally before the Council of Trent. In the third period, after the Council, in order to meet a new fashion of opposition, the commentators generally no longer follow the letter of the Summa article by article, but write disputationes on the problems debated in their own times. Each of the three methods has its own raison d'etre. The Thomistic synthesis has thus been studied from varied viewpoints, by contrast with other theological systems. Let us see this process at work in each of these periods. The first Thomists appear at the end of the thirteenth century and the beginning of the fourteenth. They defend St. Thomas against certain Augustinians of the ancient school, against the Nominalists and the Scotists. We must note in particular the works of Herve de Nedellec against Henry of Ghent; of Thomas Sutton against Scotus, of Durandus of Aurillac against Durandus of Saint-Pourcain and against the first Nominalists. Next, in the same period, come works on a larger scale. Here we find John Capreolus,  whose Defensiones  earned him the title princeps thomistarum. Capreolus follows the order of the Lombard Sentences, but continually compares the commentaries of Thomas on that work with texts of the Summa theologiae and of the Disputed Questions. He writes against the Nominalists and the Scotists. Similar works were written in Hungary by Peter Niger,  in Spain by Diego of Deza,  the protector of Christopher Columbus. With the introduction of the Summa as textbook, explicit commentaries on the Summa theologiae began to appear. First in the field was Cajetan (Thomas de Vio). His commentary  is looked upon as the classic interpretation of St. Thomas. Then followed Conrad Kollin,  Sylvester de Ferraris,  and Francis of Vittoria. Vittoria's work remained long in manuscript and was lately published. A second work of Vittoria, Relectiones theologicae, was likewise recently published. . Numerous Thomists took part in the preparatory work for the Council of Trent. Noted among these are Bartholomew of Carranza, Dominic Soto, Melchior Cano, Peter de Soto. The Council  itself, in its decrees on the mode of preparation for justification, reproduces the substance of an article by St. Thomas. Further, in the following chapter on the causes of justification, the Council again reproduces the teaching of the saint. When on April 11 1567, four years after the end of the Council, Thomas of Aquin was declared doctor of the Church, Pius V,  in commending the saint's doctrine as destruction of all heresies since the thirteenth century, concluded with these words: "As clearly appeared recently in the sacred decrees of the Council of Trent." . After the Council of Trent, the commentators, as a rule, write Disputationes. Dominic Banez, an exception, explains still article by article. The chief names in this period are Bartholomew of Medina,  and Dominic Banez. We must also mention Thomas of Lemos 1629): Diego Alvarez (1635): John of St. Thomas (1644): Peter of Godoy (1677). All these were Spaniards. In Italy we find Vincent Gotti (1742): Daniel Concina (1756): Vincent Patuzzi (1762): Salvatore Roselli (1785). In France, Jean Nicolai (1663): Vincent Contenson (1674): Vincent Baron (1674): John Baptist Gonet (1681): A. Goudin (1695): Antonin Massoulie (1706): Hyacinth Serry (1738). In Belgium, Charles Rene Billuart (1751). Among the Carmelites we mention: the Complutenses, Cursus philosophicus,  and the Salmanticenses, Cursus theologicus. .
Let us here note the method and importance of the greatest among these commentators. Capreolus  correlates, as we saw above, the Summa and the Disputed Questions with the Sententiae of the Lombard. Answering the Nominalists and the Scotists, he sets in relief the continuity of the saint's thought. Sylvester de Ferraris shows that the content of the Contra Gentes is in harmony with the higher simplicity of the Summa theologiae. He is especially valuable on certain great questions: the natural desire to see God : the infallibility of the decrees of providence;  the immutability in good and in evil of the soul after death, from the first moment of its separation from the body. Sylvester's commentary is reprinted in the Leonine edition of the Summa contra Gentes. Cajetan comments on the Summa theologiae article by article, shows their interconnection, sets in relief the force of each proof, disengages the probative medium. Then he examines at length the objections of his adversaries, particularly those of Durandus and Scotus. His virtuosity as a logician is in the service of intuition. Cajetan's sense of mystery is great. Instances will occur later on when he speaks of the pre-eminence of the Deity. Cajetan is likewise the great defender of the distinction between essence and existence. His commentary on the Summa theologiae was reprinted in the Leonine edition. .
Dominic Banez is a careful commentator, profound, sober, with great powers, logical and metaphysical. Attempts have been made to turn him into the founder of a new theological school. But, in reality, his doctrine does not differ from that of St. Thomas. What he adds are but more precise terms, to exclude false interpretations. His formulas do not exaggerate the saint's doctrine. Even such terms as "predefinition" and "predetermination" had been employed by Aquinas in explaining the divine decrees. A Thomist may prefer the more simple and sober terms which St. Thomas ordinarily employs, but on condition that he understands them well and excludes those false interpretations which Banez had to exclude. .
John of St. Thomas wrote a very valuable Cursus philosophicus thomisticus. Subsequent authors of philosophic manuals, E. Hugon, O. P.: J. Gredt, O. S. B.: X. Maquart, rest largely on him. J. Maritain likewise finds in them much inspiration. In John's theological work, Cursus theologicus,  we find disputationes on the great questions debated at his time. He compares the teaching of St. Thomas with that of others, especially with that of Suarez, of Vasquez, of Molina. John is an intuitionist, even a contemplative, rather than a dialectician. At the risk of diffusiveness, he returns often to the same idea, to sound its depths and irradiations. He may sound repetitious, but this continual recourse to the same principles, to these high leitmotifs, serves well to lift the penetrating spirit to the heights of doctrine. John insists repeatedly on the following doctrines: analogy of being, real distinction between essence and existence, obediential potency, divine liberty, intrinsic efficaciousness of divine decrees and of grace, specification of habits and acts by their formal object, the essential supernaturalness of infused virtue, the gifts of the Holy Spirit and infused contemplation. John should be studied also on the following questions: the personality of Christ, Christ's grace of union, Christ's habitual grace, the causality of the sacraments, the transubstantiation, and the sacrifice of the Mass. 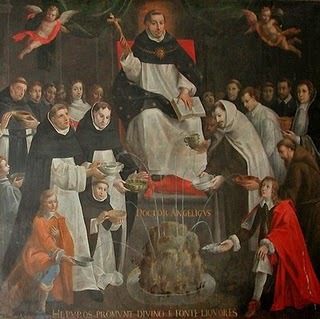 In their methods the Carmelites of Salamanca, the Salmanticenses, resemble John of St. Thomas. They first give, in summary, the letter of the article, then add disputationes and dubia on controverted questions, discussing opposed views in detail. Some of these dubia on secondary questions may seem superfluous. But he who consults the Salmanticenses on fundamental questions must recognize in them great theologians, in general very loyal to the teaching of St. Thomas. You may test this statement in the following list of subjects: the divine attributes, the natural desire to see God, the obediential potency, the absolute supernaturalness of the beatific vision, the intrinsic efficaciousness of divine decrees and of grace, the essential supernaturalness of infused virtues, particularly of the theological virtues, the personality of Christ, His liberty, the value, intrinsically infinite, of His merits and satisfaction, the causality of the sacraments, the essence of the sacrifice of the Mass. Gonet, who recapitulates the best of his predecessors, but also, on many questions, does original work, is marked by great clarity. So likewise is Cardinal Gotti, who gives a wider attention to positive theology. Billuart, more briefly than Gonet, gives a substantial summary of the great commentators. He is generally quite faithful to Thomas, often quoting in full the saint's own words. While we do not cite in detail the works of contemporary Thomists, we must mention N. del Prado's two works: De veritate fundamentali philosophiae christianae,  and De Gratia et libero arbitrio. He closely follows Banez. Further, A. Gardeil's three works: La credibilite et l'apologetique,  Le donne revele et la theologie,  and La structure de l'ame et l'experience mystique. Inspired chiefly by John of St. Thomas, his work is still personal and original. 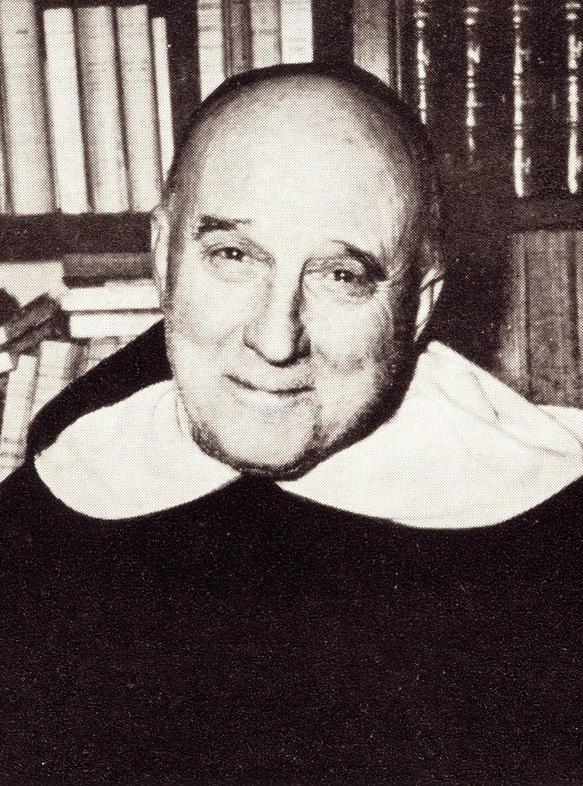 Among those who contributed to the resurgence of Thomistic study, before and after Leo XIII, we must mention eight names: Sanseverino, Kleutgen, S. J.: Cornoldi, S. J.: Cardinal Zigliara, O. P.: Buonpensiere, O. P.: L. Billot, S. J.: G. Mattiussi, S. J.: and Cardinal Mercier. 99. Sess. VI, chap. 6. 100. IIIa, q. 85, a. 5. 101. Ia IIae, q. 112, a. 4; IIa IIae, q. 24, a. 3. 102. Et liquido nuper in sacris concilii Tridentini decretis apparuit. 103. Bull. ord. praed. : V, 155. 104. On the Ia IIae, Salamanca, 1577, and on the IIIa, Salamanca, 1578. 105. On the Ia, Salamanca, 1584-88 (recently reprinted, Valencia, 1934); on the IIa IIae, Salamanca, 1584-94; and on the IIIa (still in manuscript). 107. Published 1631, 1637, 1641 (new ed. : Paris, 1871). 108. Defensiones (latest edition, Tours, 1900-1908). 109. Bk. III, chap. 51. 111. Bk IV, chap. 95. Note here some differences between him and Cajetan. 112. De entia et essentia; De analogia nominum. Noteworthy too are his opuscula on the sacrifice of the Mass. 115. Cf. Dict. theol. cath. : s. v. Banez. 116. Re-edited at Paris, 1883; and recently again, by Beatus Reiser, O. S. B.: Turin, 1930-37. 117. Re-edited at Paris, 1883-86. The Benedictines of Solesmes are now again re-editing the work. 119. Fribourg, three volumes, 1907. Quaeritur: I've run into several articles by modern Thomists attacking traditional Thomists (e.g. Garrigou-Lagrange) for being "essentialists." Frequently, these moderns have been heavily influenced by Wittgenstein, which I find suspect to start with. At any rate, it seems that a large part of their attack is based on an allegation that the "essentialists" inherited a mistaken idea regarding analogy from Cajetan (interestingly, Charles de Koninck holds that Cajetan was incorrect as well, at least in the article I read by him). I was able to find an abstract of a promising looking article (“The Semantics of Analogy according to Thomas de Vio Cajetan’s De Nominum Analogia” by Joshua Hochschild), but I haven't been able to get access to the entire thing. 1) What is your take on the attacks on traditional Thomism as "essentialist"? Was Cajetan wrong in his analysis of analogy? I saw your post from 2006 about Gilson, but I was wondering if you had more to add. 2) Is there anywhere one can find a brief history of this debate? I read a past post on Gilson and his dismissal of the commentators and have read a little by him on the matter (I don't aggree with him), but I was wondering if you had anything further to add. 3) Mcinerny's book on analogy is quite polemic, but I was told that he softened his views afterwards. Is his newer book worth one's time? 4) Why is the debate today so incredibly one-sided by and large (i.e. Cajetan was wrong, end of story)? It seems to be given as a fact that Cajetan was wrong (e.g. many articles simply have it as a footnote that Cajetan had a severely flawed yet influential notion of analogy). It is unclear to me as to what Santiago Ramirez's position is on account of my poor (but improving) Latin. Also, what-if anything- is worth reading by Joseph Owens? I've had him recommended to me, but at first glance he seems to be against all the commentators. I haven't really looked at him much, but I was wondering if he's worth reading, in your opinion. Finally, I found a site with literally hundreds of articles, papers, and lecture notes of Charles de Koninck. I thought it might be good to link. Respondeo: I will first give you my general thought on the matter, and then proceed to give a more direct response to (what’s left of) your questions. I. I have not yet tackled Ramirez; all I know is that his view is based on Cajetan and he rejects McInerny’s view. II. 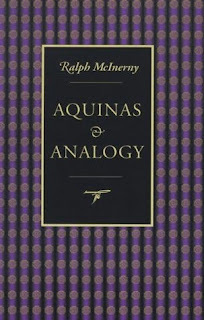 I have found reading McInerny's newer book (not "The Logic of Analogy," from 1961, but rather "Aquinas and Analogy," published in 1996) a great learning experience, not because I agree, but because I disagree. Unfortunately, I'm still in the middle of it; I read about half of it last Summer and got too busy and never finished. So far it is indeed very polemical. He dedicates the first chapter to attacking Cajetan (the chapter is titled "Where Cajetan Went Wrong"). The rest of the book (so far) seems to be based on these criticisms of Cajetan. A. Cajetan bases his view on analogy on text from Aquinas' (early) Commentary on the Sentences (I, d. 19, q. 5, a. 1 ad 1m). 3) analogy of proportionality (e.g., "being" is said of a substance and of an accident, and of God and creatures). C. Cajetan admits that the first kind is only abusively called "analogy", because it is really closer to univocity, but the other two kinds do represent genuine, irreducible species of analogy. 3) Analogical names (e.g., again, the dog is "healthy," the dog's food is "healthy," and the dog's urine is "healthy"). Then Aquinas proceeds to apply this third kind of name (analogous names) to speak of the difference between God and creatures. E. Thus, McInerny concludes, there is only one kind of analogy. The kind of analogy that obtains between "healthy" things is the same kind of analogy that he will apply to God and creatures. Hence, Aristotle is right, Aquinas is right, but Cajetan is wrong. A. Aristotle is right. Aquinas is right. Cajetan is right. McInerny is wrong at least insofar as he thinks these three are irreconcilable. B. McInerny is arguing on the basis of Aquinas' examples. He sees Aquinas in the Summa giving one example of "analogous names" (the "healthy" example) and then saying that analogous names are used between God and creatures. Therefore, he concludes, the kind of analogy that obtains between healthy things is the same as the kind of analogy that obtains between God and creatures. In general, he concludes that there is no basis in Aquinas to make distinctions between kinds of analogous name. But this is bad reasoning. This is like arguing that, because cats are an example of mammals, and we say that dogs are mammals, it follows that cats are the same kind of mammals as dogs. It's literally the same form of reasoning: because healthy things are an example of analogous names, and we say that God and creatures are given analogous names, it follows that the healthy things are applied the same kind of analogous name as God and creatures. 1. Cajetan is interpreting the passage of the Sentences correctly: there are three distinct species within the genus "analogous names." 2. The text of the Summa is contrasting the GENUS "analogous names" with two other genera, "univocal names" and "equivocal names." c. Cajetan's classification of the analogy of inequality as being really equivocity that is called analogy only abusively. This would make Cajetan, Aquinas, and Aristotle all agree. Aristotle would be listing only A and B; Aquinas would be listing A, B1, and B2; and Cajetan would be listing B2a, B2b, and B2c. Q1. I’m no longer so sure that the criticism that Cajetan was an “essentialist” is not based on this issue of analogy, as much as on the fact that Cajetan was very fond of performing a logical analysis on anything that he talked about, thus almost “reifying” logical “essences.” And for ‘existentialist’ Thomists, this is intolerable. Q2. I’m not sure where you can find an updated history of the debate, but I believe Ramirez goes into it ad nauseam, from ancient Greek philosophy up until his time (1960s). Q3. I am aware of the two mentioned above. If there is a newer one I don’t know anything about it. Q4. Cajetan has to be wrong because he is the most prominent of the scholastic Thomists, and scholastic Thomism is over. Q5. Joseph Owens: read his dissertation on Aristotle, titled: The Doctrine on Being in the Aristotelian Metaphysics. It’s a masterpiece as a historical interpretation of Aristotle which no one has suprassed it in almost half a century. Anything he has written on Aquinas, however, I wouldn’t be so excited about; it's not awful, but it's just the same old historical Thomism.